For other uses, see Umbria (disambiguation). Umbria (/ˈʌmbriə/ UM-bree-ə; Italian pronunciation: [ˈumbrja]) is a region of central Italy. It includes Lake Trasimeno and Marmore Falls, and is crossed by the River Tiber. The regional capital is Perugia. Umbria is known for its landscapes, traditions, history, culinary delights, artistic legacy, and influence on culture. The region is characterized by hills, mountains, valleys and historical towns such as the university centre of Perugia, Assisi, a World Heritage Site associated with St. Francis of Assisi, the Basilica of San Francesco and other Franciscan sites, works by Giotto and Cimabue, Terni. The hometown of Santa Rita, the hometown of St. Valentine, Norcia, the hometown of St. Benedict, Città di Castello, main center of the early Renaissance situated in the Tiber High Valley,  Gubbio, the hometown of St. Ubaldo, Spoleto, Orvieto, Castiglione del Lago, Narni, Amelia, and other small cities. Umbria is bordered by Tuscany to the west and the north, Marche to the east and Lazio to the south. Partly hilly and mountainous, and partly flat and fertile owing to the valley of the Tiber, its topography includes part of the central Apennines, with the highest point in the region at Monte Vettore on the border of the Marche, at 2,476 metres (8,123 feet); the lowest point is Attigliano, 96 metres (315 feet). It is the only Italian region having neither a coastline nor a common border with other countries. The comune of Città di Castello has an exclave named Monte Ruperto within Marche. Contained within Umbria is the hamlet of Cospaia, which was a tiny republic from 1440 to 1826, created by accident. Umbria is crossed by two valleys: the Umbrian valley ("Valle Umbra"), stretching from Perugia to Spoleto, and the Tiber Valley ("Val Tiberina"), north and west of the first one, from Città di Castello to the border with Lazio. The Tiber River forms the approximate border with Lazio, although its source is just over the Tuscan border. The Tiber's three principal tributaries flow southward through Umbria. The Chiascio basin is relatively uninhabited as far as Bastia Umbra. About 10 kilometres (6 miles) farther on, it joins the Tiber at Torgiano. The Topino, cleaving the Apennines with passes that the Via Flaminia and successor roads follow, makes a sharp turn at Foligno to flow NW for a few kilometres before joining the Chiascio below Bettona. The third river is the Nera, flowing into the Tiber further south, at Terni; its valley is called the Valnerina. The upper Nera cuts ravines in the mountains; the lower, in the Tiber basin, has created a wide floodplain. In literature, Umbria is referred to as Il cuore verde d'Italia or The green heart of Italy. The phrase is taken from a poem by Giosuè Carducci, the subject of which is the source of the Clitunno River in Umbria. The region is named for the Umbri people, an Italic people which was absorbed by the expansion of the Romans. 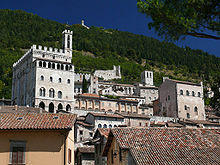 The Umbri's capital city was Gubbio, where today is housed the longest and most important document of any of the Osco-Umbrian group of languages, the Iguvine Tablets. Pliny the Elder recounted a fanciful derivation for the tribal name from the Greek ὄμβρος "a shower", which had led to the confused idea that they had survived the Deluge familiar from Greek mythology, giving them the claim to be the most ancient race in Italy. In fact, they belonged to a broader family of neighbouring peoples with similar roots. Their language was Umbrian, one of the Italic languages, related to Latin and Oscan. The northern part of the region was occupied by Gallic tribes. The Umbri probably sprang, like neighboring peoples, from the creators of the Terramara, and Proto-Villanovan culture in northern and central Italy, who entered north-eastern Italy at the beginning of the Bronze Age. The Etruscans were the chief enemies of the Umbri. The Etruscan invasion went from the western seaboard towards the north and east from about 700 to 500 BC, eventually driving the Umbrians towards the Apennine uplands and capturing 300 Umbrian towns. Nevertheless, the Umbrian population does not seem to have been eradicated in the conquered districts. The border between Etruria and Umbria was the Tiber river: the ancient name of Todi, Tular ("border"), remembers that. After the downfall of the Etruscans, Umbrians aided the Samnites in their struggle against Rome (308 BC). Later communications with Samnium were impeded by the Roman fortress of Narnia (founded 298 BC). Romans defeated the Samnites and their Gallic allies in the battle of Sentinum (295 BC). Allied Umbrians and Etruscans had to return to their territories to defend against simultaneous Roman attacks, so were unable to help the Samnites in the battle of Sentinum. The Roman victory at Sentinum started a period of integration under the Roman rulers, who established some colonies (e.g., Spoletium) and built the via Flaminia (220 BC). The via Flaminia became a principal vector for Roman development in Umbria. During Hannibal's invasion in the second Punic war, the battle of Lake Trasimene was fought in Umbria, but the local people did not aid the invader. During the Roman civil war between Mark Antony and Octavian (40 BC), the city of Perugia supported Antony and was almost completely destroyed by Octavian. In Pliny the Elder's time, 49 independent communities still existed in Umbria, and the abundance of inscriptions and the high proportion of recruits in the imperial army attest to its population. Under Augustus, Umbria became the Regio VI of Roman Italy. Today Umbria is different from Roman Umbria. Roman Umbria extended through most of what is now the northern Marche, to Ravenna, but excluded the west bank of the Tiber, which belonged to Etruria. Thus Perugia was an Etruscan city, and the area around Norcia was in the Sabine territory. After the collapse of the Roman empire, Ostrogoths and Byzantines struggled for the supremacy in the region, and the decisive battle of the war between these two peoples took place near modern Gualdo Tadino. After the Ostrogoths, the Lombards founded the duchy of Spoleto, covering much of today's southern Umbria, but the Byzantine were able to keep in the region a corridor along the Via Flaminia linking Rome with the Exarchate of Ravenna and the Pentapolis.The Lombard king controlled also the northern part of the region ruled directly by Pavia. When Charlemagne conquered most of the Lombard kingdoms, some Umbrian territories were given to the Pope, who established temporal power over them. Some cities acquired a form of autonomy named comune. These cities were frequently at war with each other, often in a context of more general conflicts, either between the Papacy and the Holy Roman Empire or between the Guelphs and the Ghibellines. In the early 14th century, the signorie arose and the most important of them were those of the Vitelli in Città di Castello, of the Baglioni in Perugia and of the Trinci in Foligno, but the two last ones were subsumed by the middle of the same century into the Papal States by Cardinal Albornoz, who in this way prepared the return of the pope from Avignon to Rome. Città di Castello was subsumed later into the Papal States by Cesare Borgia. During 15th century Renaissance spread in the northern part of the region. It was in this period that humanists started to use again the ancient denomination of "Umbria" to name the area, which until then has been named "Ducato", after the Duchy of Spoleto in the southern part of it. The supremacy of the pope on Umbria was reinforced in 16th century through the erection of a fortress in Perugia by Pope Paul III, named after him Rocca Paolina. The Papacy ruled the region uncontested until the end of the 18th century. After the French Revolution and the French conquest of Italy, Umbria became part of the ephemeral Roman Republic (1798–1799) and later, part of the Napoleonic Empire (1809–1814) under the name of department of Trasimène. After Napoleon's defeat, the Pope regained Umbria and ruled it until 1860. In that year, during Italian Risorgimento, Umbria with Marche and part of Emilia Romagna were annexed by Piedmontese King Victor Emmanuel II, and the people of Perugia destroyed in the same year the Rocca Paolina, symbol of the papal oppression. The region of Umbria, with capital Perugia, was part of the Kingdom of Italy in the following year. The region, whose economy was mainly based on agriculture, experienced a dramatic economic shift at the end of the 19th century with the founding of the Acciaierie di Terni, a major steelwork placed in Terni because of its abundance of electric power due to the Marmore waterfall and its secluded position. The region of Umbria at the time was somewhat larger than today, comprising Rieti to the south, now part of Lazio. 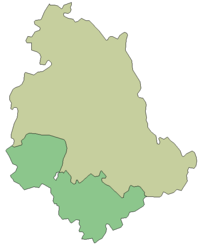 Rieti was detached and added to the Province of Rome (Lazio) in 1923. In 1927, the region of Umbria was divided into the provinces of Perugia and Terni. During WWII, the industrial centers of the region like Terni and Foligno were heavily bombed and in 1944 became a battlefield between the allied forces and the Germans retreating towards the Gothic Line. In 1946, Umbria was incorporated into the Italian Republic as a region, comprising the two provinces of Perugia and Terni. One of the most important festivals in Umbria is "the festival of the Ceri (Candles)", also known as Saint Ubaldo Day in Gubbio. The race has been held every year since 1160, on the 15th day of May. The festival is focused around a race consisting of three teams of cerioli, carrying large symbolic "candles" topped by saints, including St. Ubald (the patron saint of Gubbio), S. Giorgio (St. George), and S. Antonio (Anthony the Great), and run through throngs of cheering supporters. The cerioli are clad in the distinctive colors of yellow, blue or black, according to the saint they support, with white trousers and red belts and neckbands. They travel up much of the mountain from the main square in front of the Palazzo dei Consoli to the basilica of St. Ubaldo, each team carrying a statue of their saint mounted on a wooden octagonal prism, similar to an hour-glass shape 4 metres tall and weighing about 280 kg (617 lb). The race has strong devotional, civic, and historical overtones and is one of the best-known folklore manifestations in Italy, and therefore the Ceri were chosen as the heraldic emblem on the coat of arms of Umbria as a modern administrative region. Umbria is not only known for its historical recollections such as the festival of the Ceri, Calendimaggio, but also for one of the biggest jazz music festivals called Umbria Jazz. Umbria Jazz was born as a festival in 1973 and since 2003 has been held in the Umbrian capital "Perugia" in July; it has become the fixed appointment of all jazz and good music lovers. The present economic structure emerged from a series of transformations which took place mainly in the 1970s and 1980s. During this period, there was rapid expansion among small and medium-sized firms and a gradual retrenchment among the large firms which had hitherto characterised the region's industrial base. This process of structural adjustment is still going on. Economically the most important region is the upper Tiber valley with Città di Castello. Terni steelworks (stainless steel, titanium, alloy steel) and processing companies (automotive, stainless steel tubes, industrial food facility) account for 20 to 25 % of Umbria's GDP. In Terni there are also many multinational companies in the fields of chemistry, hydroelectric power, renewable sources of energy, and textiles (Alcantara). In the rest of the region the ornamental ceramics industry is much esteemed. As of 2008[update], the Italian national institute of statistics ISTAT estimated that 75,631 foreign-born immigrants live in Umbria, equal to 8.5% of the total population of the region. Umbria was a former stronghold of the Italian Communist Party, forming with Tuscany, Emilia-Romagna and Marche what was then known as Italy's "Red Regions". Nowadays, Umbria is still a stronghold of the Democratic Party and left-leaning parties. ^ Casalini, Simona (30 October 2016). "Terremoto in Centro Italia". Repubblica (in Italian). Retrieved 30 October 2016. ^ Pliny the Elder, The Natural History, 3.6; 3.19. ^ a b c "Eurostat". Circa.europa.eu. Archived from the original on 21 July 2011. Retrieved 24 April 2010. ^ "Sagrantino di Montefalco: From Umbria Comes The Best Red Wine You Never Tasted!". IntoWine.com. This article incorporates text from a publication now in the public domain: Chisholm, Hugh, ed. (1911). "Umbria" . Encyclopædia Britannica (11th ed.). Cambridge University Press. Wikisource has the text of the 1911 Encyclopædia Britannica article Umbria. Wikimedia Commons has media related to Umbria. Thayer, William P. (2010). "Umbria: the 92 Comuni". University of Chicago. Retrieved 24 August 2010.